» Still puzzled by roundabouts? Main Street circle: It looks nice and round. In a couple of weeks Albany will have its third roundabout or traffic circle, so it’s time for a refresher on how to drive through one. One bit of advice: Don’t stop unless you have to. 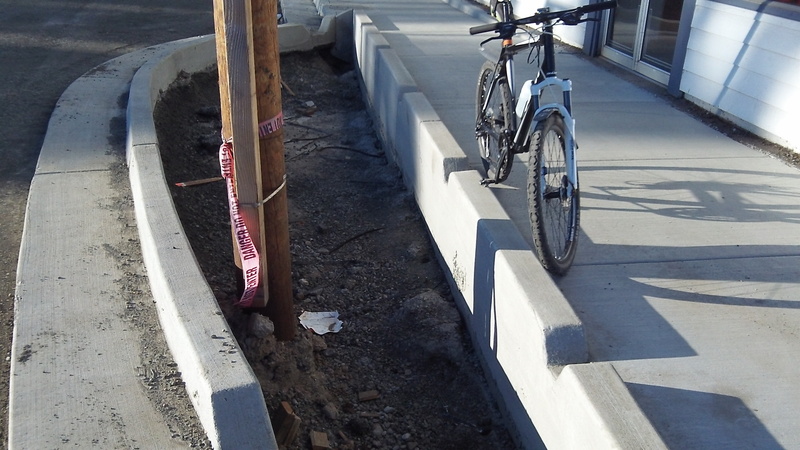 One of the deep runoff swales we’ve heard so much about. Let’s hope no one falls in. As the Oregon Drivers Manual points out, “traffic entering a roundabout must yield to those already in the circle.” Note that it says “already in the circle,” not “about to enter the circle.” So it’s perfectly fine to enter the traffic circle just as another car is also entering the circle on your left side. If you’re both entering at the same time, you don’t have to wait for the other guy to go past. This point is lost on some drivers. They see somebody approaching the roundabout from the left, they figure they better stop. Somebody behind them, more attuned to the guiding principle of roundabouts, may not expect them to stop. And that’s how rear-end collisions happen. Pedestrians in crosswalks have the right of way at roundabouts just like at other intersections. That’s why occasionally traffic inside the roundabout does have to come to a halt in order to let somebody in front leave the circle. The unfortunate effect is like that of one guy in a revolving door stopping and making all those behind him bumping into each other. Pedestrians might want to keep that in mind and not step off the curb of a roundabout unless no traffic is coming round the bend. Bicyclists, by the way, are advised to merge into the traffic lane in roundabouts. If you see any, my advice is don’t run them down. The Oregon manual wants drivers to signal a right-hand turn before leaving the roundabout. That has proved a problem now and then on the very small roundabout on North Albany Road. You can’t always get the right-side blinker to work when your wheel is cranked way over to the left, which it must be to get around the circle. The whole idea of roundabouts is to keep traffic moving without stopping. It works when we follow the rules and common sense. I use the roundabout in North Albany almost daily. I rarely have to come to a complete stop. 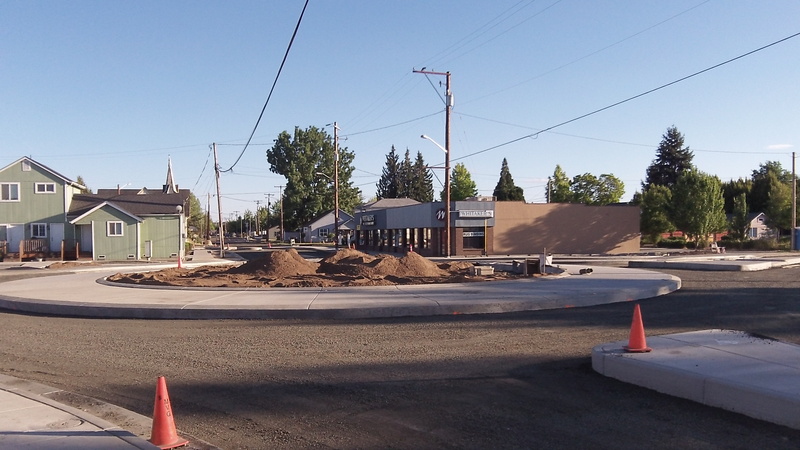 Aside from the failed “planter box” circle experiment in Corvallis, which should have never been tried, I would welcome a circle at almost any intersection. While people yielding to cars not in the circle is an irritant, I am more annoyed by the occasional doofus that tries to yield to cars approaching the circle while they are within it. Fortunately, the vast majority of drivers are capable of comprehending the concept of yielding to cars in the circle. As for the rest, I wonder what other traffic laws are beyond their cognitive skills.